On April 1, the City of Boulder’s Planning Board, in a series of 4-3 votes, set the stage for 4-story buildings on the south side of Canyon adjacent to the city park and a residential neighborhood. 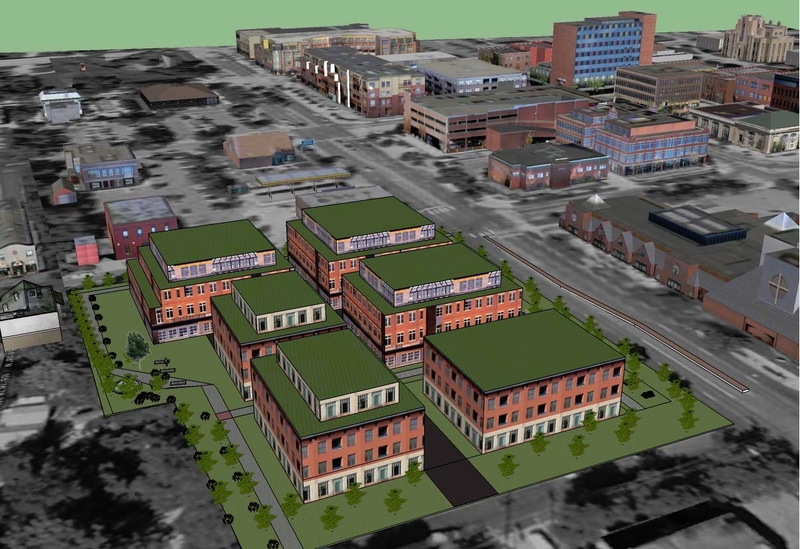 City staff had recommended changes to zoning and the Downtown Design Guidelines that would have ratcheted down, slightly, the potential intensity of redevelopment in the 5½ block area from 13th to 17th Streets on the south side of Canyon Blvd. Unlike the downtown (north) side of Canyon, this area is adjacent to the Goss-Grove neighborhood, the city park and Boulder Creek. It is traversed by the North Boulder Farmers Ditch. The Dushanbe Tea House, the Boulder Museum of Contemporary Art and the Farmers Market are also located in the area under review. 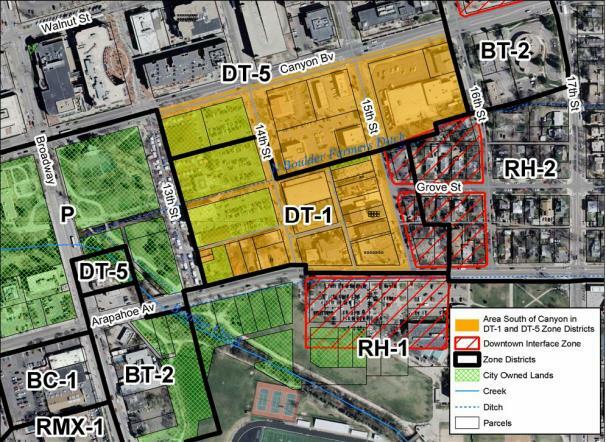 In December 2008, Council directed staff to develop an urban design vision for the south side of Canyon that would include updating the Downtown Design Guidelines, revising the Land Use code (a Boulder Valley Comprehensive Plan term analogous to zoning), and defining public benefits that would be required in exchange for density bonuses to developers. In January 2009, a proposed 28,100-square-foot, four-story, mixed-use building at the site of Robb’s Music (1580 Canyon) was rejected by Council as being too tall for an area near a residential neighborhood. Limit the height of buildings in interface areas (adjacent to the residential neighborhood) to 3 stories. Reduce the current floor area ratio (FAR) of 2.7 to 2.0. (For comparison, the 4-story, First National Bank building on the NW corner of Broadway and Canyon, 1155 Canyon, has an FAR of 2.3). Members of the public spoke both for and against the staff recommendations. Business owners including Jack Stoakes of Liquor Mart and James Travels’ Andy and Don James spoke against the height and FAR reductions. Dylan Williams, an engineer, urged the Planning staff to revisit their analysis of occupancy rates of the luxury condos on Canyon, suggesting that the staff’s methodology significantly overestimated the occupancy. Neighbors Forrest Williams, Kate Remley and Elizabeth Allen spoke against blocking the views. Builder Phil Shull and land use attorney Ed Bryne spoke against limiting development potential in the area. Much of Planning Board’s deliberations centered on the existing 4-story, 55-foot-tall buildings on the north side of Canyon Blvd., with some members arguing that those buildings were a Planning Board mistake and that measures should be put in place to prevent such mistakes in the future. Arguments put forth for rejecting staff’s recommendations included the assertion that the zoning should be the same on both sides of Canyon as a fundamental planning principle and concerns that limitations would dampen development. The Planning Board rejected the recommendations limiting building sizes, with members Elise Jones, Mary Young and newcomer Tim Plass voting in support of the limits and members Andrew Shoemaker, Willa Johnson, Bill Hollicky and newcomer Danica Powell voting against. 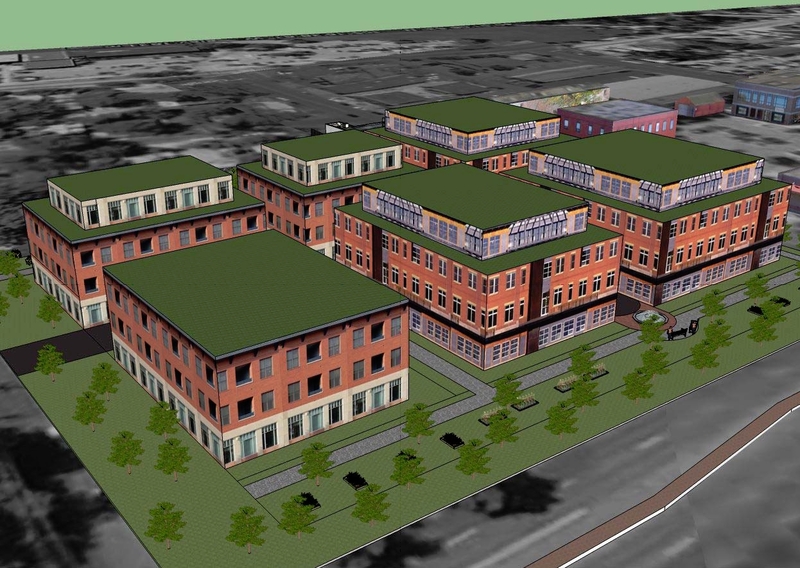 How do you feel about 4-story buildings on the south side of Canyon? Let us know by voting in the Blue Line poll in the sidebar. Why not have four (and more) story tall buildings along Canyon? Then it would like more LIKE a canyon… FEH.